The Hainan Gibbon is a frugivore, eating mostly fruiting plants, therefore it is a heterotroph that fits into the food web as a primary consumer. It occasionally eats insects but does not prey on them. However, it just consumes whatever additional organisms are on the plants that it eats (Jiang Zhou et al. 2008). The gibbons have a few predators in their natural habitat. These include the Clouded Leopard and two types of eagles that attempt to prey on young gibbons: the Mountain Hawk Eagle and the Black Eagle. Mothers of the gibbons can usually scare the eagles away from babies (B.P.L. Chan et al. 2005). Figure 8. Image of gibbon spending time foraging for food and interacting with other gibbons. Before preservation of the species began, hunting and capturing of the Hainan Gibbons by humans was particularly popular. Due to poor regulation of laws, illegal pet trade of the gibbons was popular and in order to take the young the mother had to be shot, which often resulted in the death of the infant as well (T. Geissmann et al. 2013). 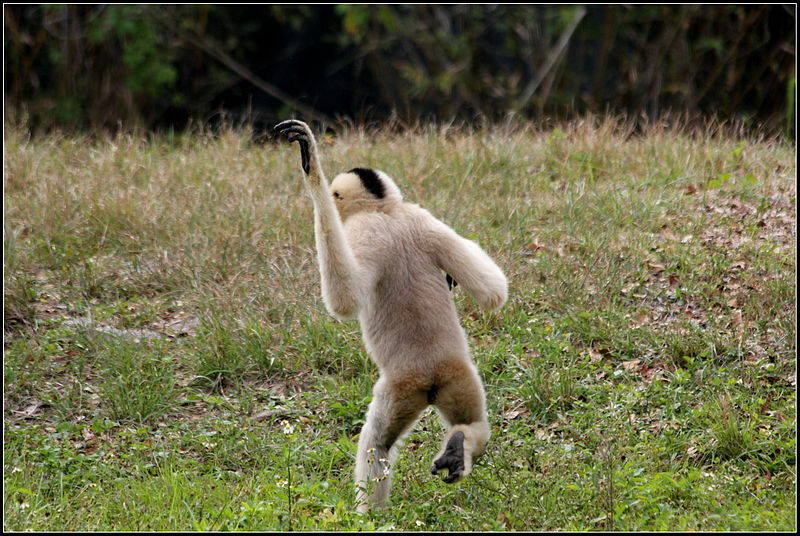 Click here to find out our references so you can learn more about the gibbon or return to the homepage.